I think I have expressed my love for cheese and bread, but just in case there is any doubt this recipe should confirm my passion...specially for the cheese portion. One small confession before I go on- I don't eat a lot of meat, no particular reason, not a vegetarian- just can live without it I guess. As a result, my meals aren't really meals in a traditional sort of way, I am completely satisfied eating cheese, olives, and bread. Specially when cooking for only myself which happens more often than not these days, as Jack is perfectly happy eating mac and cheese with a stray vegetable here and there. I bought a container of organic whole-milk ricotta cheese to make ravioli, but for some reason I just haven't been in the mood to make work intensive food lately which led me to the baked ricotta. Last time I was in New York I had baked ricotta as part of an antipasto plate and I fell in love, but when I made it at home it just wasn't the same; that is, until today- it was actually better. The first time I made the dish, I did not add enough eggs, nor did I whip them so it was a little flat and dense. As a result of that I understood I needed to make more of a souffle out of it. Second time's a charm- it was absolutely yummy, (and I say this from experience- I ate the whole thing and made quite a piglet of myself). I can already tell this is the first of many variations on this little dish- the possibilities are endless. Most any herb would complement the ricotta quite well, next time I might try sun-dried tomatoes with rosemary and possibly add non-pareil capers. As for the olives, I usually buy different varieties and mix them all together. Whole Foods has been a great source for olives since they have a wide variety in their olive bar. My current favorites are Sicilian spiced olives, which are most of what I used this time, they are just a little spicy and quite flavorful. The recipe makes 2 small 8 0z. ricotta cakes, if I was assembling an appetizer for more than four people, I would double the recipe. I don't really care for low-fat or fat-free versions of cheeses (I would rather just eat less if I was so concerned with fat content), but this is one case where low fat ricotta would work. 1. Whip 2 egg whites to soft peaks and set aside. 2. Combine ricotta,parmesan cheese, lemon zest, 2 egg yolks, thyme, salt and pepper until blended. Add about one third of the whipped egg whites and fold gently. Add remaining whipped egg whites and fold until just incorporated. 3. Divide the mixture evenly between the buttered ramekins and bake for 20-25 minutes or until lightly browned on top and a little puffy. (they will deflate a bit as they cool). Baked ricotta is best eaten warm or at room temperature. 4. Combine all the marinated olive ingredients and serve alongside the cheese with sliced French baguette. I gotta say that this is one of the very best blogs I've ever visited yet. Congrats! Take these words like a blossom blessing as I'm bloging around. I'm going through an olive phase agan right now. I also noticed the bottle of Peroni in the picture and I'm DEFINITELY in that phase, too! That is a beautiful dish. 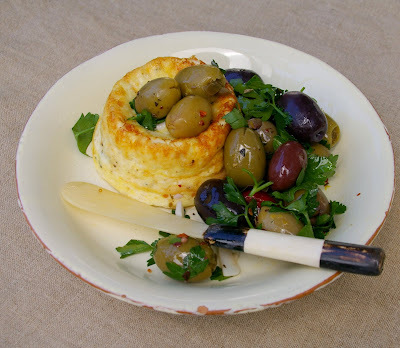 I love ricotta and olives but have never had them this way. I work for a specialty foods company in Napa Valley and have my Google Alerts set to olives. Enjoyed your recipe! Eat more olives. They're full of MUFA. You should consider entering our sandwich contest...grand prize is $25,000 and a trip to Napa Valley. Visit www.makethatsandwich.com for details. Cheese and olives are two of the foods I crave whenever things get really crazy in my life. To me this would be the perfect lunch or dinner! I could definitely eat this for dinner! My husband isn't an olive fan, so we don't have them a lot, but I am guilty of picking up a container just for myself! Looks delicious! Love your blog and i just made your blueberry muffins. I found you with a Google search because I'd lost my recipe for sauteed olives. Of course I couldn't pass up that ricotta, so made it a couple of days ago. OH MY! Totally delicious and perfect for a light meal. I will make this again! I love your site! I've made a number of your dishes, my favorite so far is the newest - lemon blueberry pound cake, so delicious! I'm sorry it has taken me so long to reply- I just noticed your question. This is not a good make-ahead dish, while I have eaten it as leftovers it really looses it's lightness. Looks divine! Have some ricotta in the fridge and was looking for a new way to use it... will def be giving this a try. 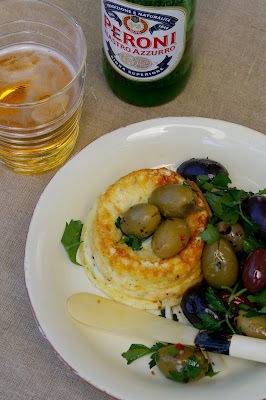 I first tasted baked ricotta cakes in Corrimal, NSW back in 1999. There was a shop called 'The Gourmet Platter' which would hold tastings every friday and one of the things I fell in love with instantly was their baked ricotta cakes with capers, ham and cheese. Tonight I used your recipe as a guide and added the triple smoked ham, grated triple cheese (mozzarella, cheddar and parmesan), capers and a sprinkle of chilli powder. Yumm! It took me back through the years and was definitely worth the effort. Thanks for sharing your recipe and I suggest you try adding the ham and triple cheese - it really adds another level of flavour. Copying and pasting! Sounds wonderful and I love that it only makes two servings ... perfect! Excitedly waiting for this to come out of the oven! Thanks for the great write up. Sign up for special discounts, recipes & more! Gourmet Girl Cookbook for sale!